An old-fashioned house perfect for a holiday at sea with ease. 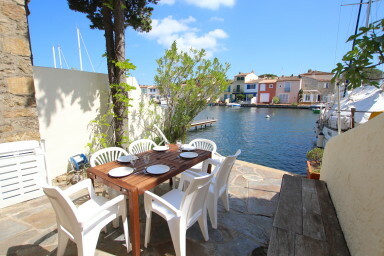 Charming typical fisherman house close to the facilities of Port Grimaud 1 and the beach. At the entrance, a little garden perfect to park the bicycles. - on the 2nd floor: one bedroom with a large bed and a balcony, one bedroom with a single bed and bunk beds and a bathroom. A South-oriented terrace with a lovely view on the canal. A 15m x 4m mooring. A well-located house in-between the beach and the facilities.